I like to write posts with a complete theme. If not a project from start to finish, then at least a whole phase. 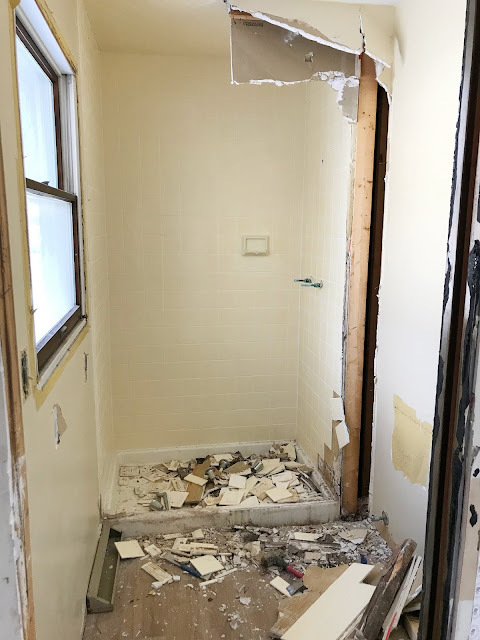 For example, the bathroom upstairs happened in a lot of stages so it was easy to post all the demo together, or the tile. This basement is all over the place and my lack of posting is due to the fact that I have no clear idea of what to document. 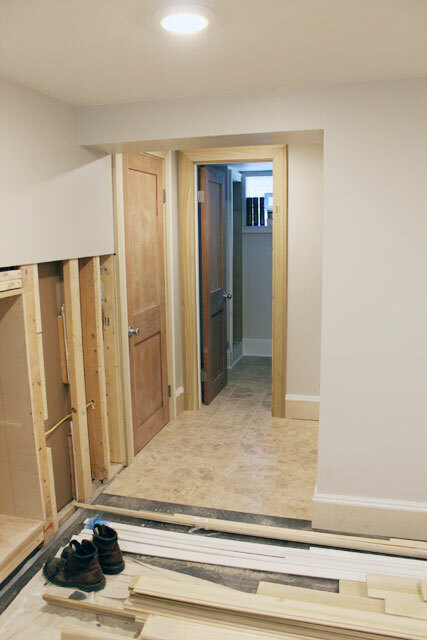 We've got four different spaces going on, the family room, laundry room, bathroom, and the stairs, hallway and closet. Instead of working and finishing each space one at a time it's easier to do them all at the same time. It's frustrating to both Mike and I because at the end of the day there's nothing complete and it doesn't seem like anything was accomplished. But, in fact a lot is getting done, it's just all the little pieces one at a time. I figured I'd get over my posting norm and just show you what's going on. We installed the flooring a couple weeks ago. I planned to do a whole write up, but then it was covered in drop cloths and tools so it wasn't really a good "after" shot. I'm going to show you anyways. I even pulled the cloth away to show you a detail of the flooring we went with, sawdust and all. Updated: We cleaned everything up over the weekend, so I was able to get a full floor shot without the drop clothes. We brought home three different samples from our local lumber liquidators and lived with them for about a week before I bit the bullet and picked this one (far left in the picture below), called St. James Meade's Ranch Weathered Wood. The other ones I liked as well, but each had something I didn't like about it. The middle one, (St. James Chimney Rock Charcoal), was very dark which I liked, but it was also very smooth and shiny. The sample was covered in fingerprints and I could only imagine what it would look like a week after installing it. The last one was really neat, (Kensington Manor Cape Doctor), but I thought it was too trendy and would stand out too much. It was made to look and feel like handscraped solid wood which I loved, but it was a little too light. The Mead's Ranch is matte with shiny grain. In person it's pretty neat, and it's already been put to the dirt test with all the dust we're making. The last test was against the tile. All work, but I liked the medium gray the best. 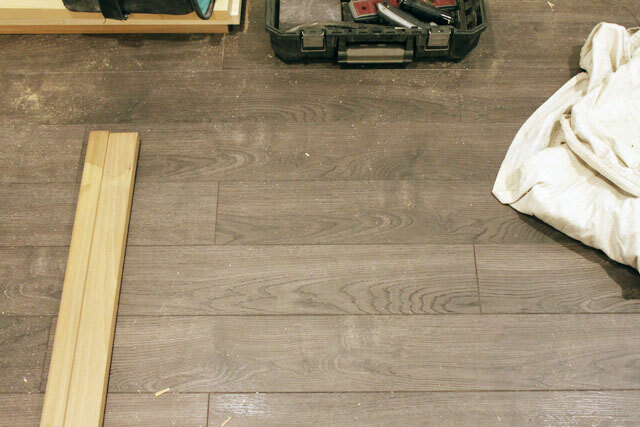 All were on sale for $1.99/sqft and were 12mm laminate with a pre-glued underlayment. They were all floating floor systems with tongue and groove planks. I laid everything out, (since Mike started without me and chose an alternating joint pattern that I didn't like. I made him pull up about 5 rows. He was not happy with me. ), and made sure the wood patterns were random and didn't duplicate. Once the measurements were done for a couple rows, we knew what had to be cut a couple rows ahead of time. I laid it out, told him the measurements, and he cut and snapped into place. It was pretty easy, and very rewarding when it was all finished. 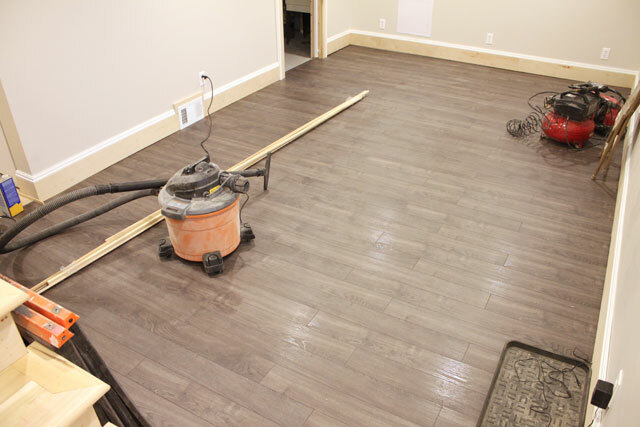 The reason the cloths were put down right after installing the flooring was to add all the trim. Which just happens to be the last stage of the project. 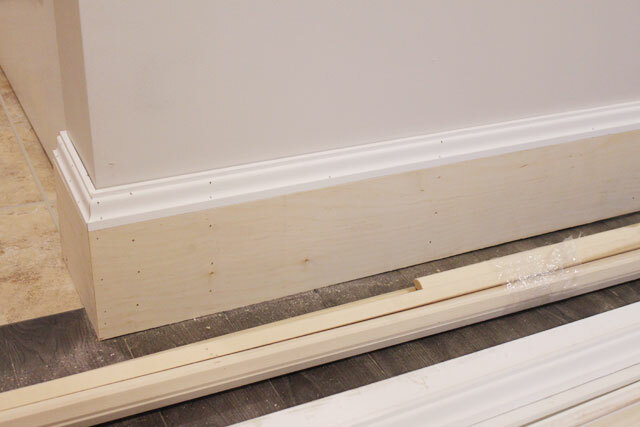 The problem is the trim involves so much, including the windows, baseboard, built-in cabinets, and stairs, and it's one of the most tedious projects. It also doesn't help that I can't really be of very much assistance. Mike likes to work at his own pace, and take his own measurements, so I have to just wait until it's all done to get down there with my paint brush. He started in the little hallway and worked into the bathroom and then back around the nook into the main room. He works pretty quickly, (when the table saw doesn't break down - ugh! 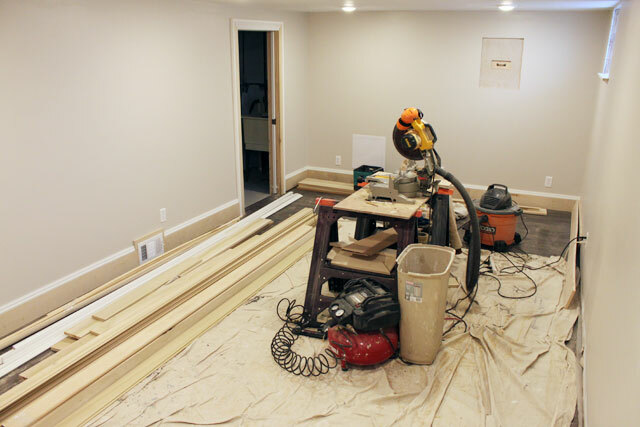 ), and we chose to bring all the materials downstairs along with the chop saw to make it even easier. The table saw stays in the garage, so Mike gets a pretty good workout when he needs long pieces ripped down - up the basement stairs then down the deck stairs then out to the garage. Then back in reverse. You can see why we felt it was worth it to bring most of it downstairs and worry about the clean-up later. We matched the trim throughout the house by ripping down some plywood then adding a cap. I try to get in and prime and paint at this step before the shoe is added, so that I don't have to worry about getting a perfect line against the finished flooring. 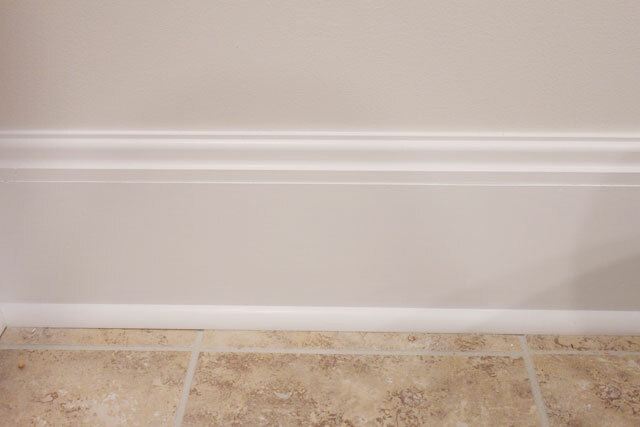 We finished some walls in the bathroom, and this is what the trim looks like when it's complete. Like I said it's really tedious, but definitely worth it in our opinions. 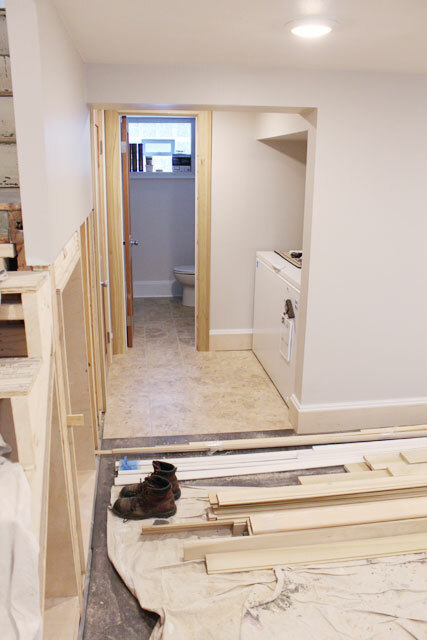 The rooms that were renovated before we moved in, (upstairs bathroom, kitchen, and basement), all looked disjointed and our goal was to match the rest of the house, and one way of doing that is to continue all the same trim. A couple weeks ago I gave Mike until the end of the month to finish everything. With one more weekend left I think we'll cut it close, but we may just finish this bad boy! 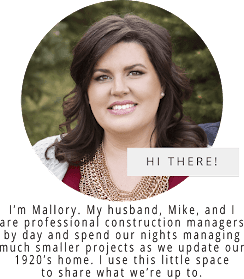 Not that there's any liquidated damages, (money the construction companies have to pay the owner if the project isn't finished by a certain day), but he has to finish eventually, because I've got a wedding to-do list a mile long! I just wanted to let you know I've selected your blog for the Liebster Award. You can get more details on my blog at http://loveofsunshine.com/blog when it posts on Friday 2/22/13. The award was passed along to me by another blogger so I hope you’ll join in the fun! Hi! I just came across your blog. We're considering the Meades Ranch Weathered Wood from Lumber Liquidators as well. Do you find that you see dust, dirt, etc. easily? Looks great! Hi Jessica! Thanks for checking out our basement! We loved the laminate we picked out, unfortunately we had a uncommonly strong rainstorm for the area a couple months ago and our basement flooded, so we had to tear it out. You can read about the sad details here: http://our1stnest.blogspot.com/2013/07/switching-laminate-with-carpet.html. In our 5 months or so that we did have the flooring we found that it was a nice medium to dark color and hid some dirt/dust but there were definitely some that were visible. We have a gray cat who sheds and I could see the little dust bunnies that his hair creates towards the baseboards and corners. It was also connected to our laundry room which is unfinished, so we may have more dirt/dust than you might have. Overall it's nothing more than what the rest of our house shows, (which is a warmer wood tone), but more than what carpet shows. Quick spot vacuuming took care of it for us. Hope this helped, and I'm a little jealous since we really did love the floor, while it lasted! !